Provided by the publisher. All opinions expressed are my own. and that's where I'll stop. The funny thing about inventions is once they are adopted you can't imagine what you did without them. 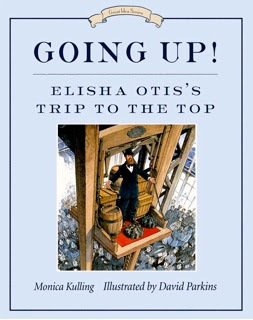 Certainly the shape of Japanese cities was a lot different before the invention of the elevator - and for that we have to thank Elisha Otis. This invention didn't just come about by a sudden Eureka! moment, however. Mr. Otis had a long road beforehand. He worked on a farm and as a wagon driver, he owned a mill, and he made bed frames. These varied experiences gave him a breadth of knowledge from which to work when he started inventing, first a rail turner, then a safety brake for a platform that moved machinery. That's what led to the invention of the platform that moved people - the elevator! Just inventing something cool isn't the end though - you need to to market it to the people. Would you have been the first person to volunteer to go up in an elevator? I probably wouldn't have! But Otis put himself on display as he used the elevator at the world's fair, and that's what convinced people that it was as safe as it was useful. Going Up! is only the latest in Tundra Books' Great Idea series, after It's a Snap, All Aboard, and In the Bag! All of these books about inventors of gadgets we can't live without today are fantastic introductions to history and science for kids. Going Up! gives a great introduction to the entrepreneurial spirit and the art of perseverance. David Parkins' illustrations are detailed and help drop the reader into a previous century. Coupled with Kulling's enthusiastic writing, it's easy to see why this book was nominated for a Cybils Nonfiction Picture Book Award for this year. This review is part of Nonfiction Monday, hosted today by The Flatt Perspective. I'll be hosting next week so be sure to stop by with a link and check out other great nonfiction kidlit reviews! Hi there! Thanks for sharing this interesting book -- I can't wait to read it! It's right up my alley -- biography of a creative person. And I like the snippet you shared with us. What a great topic for a book. Thanks for highlighting it and adding it to the Nonfiction Monday round-up. This looks great! We’ve ben reading a lot of picture book biographies lately and this one looks like a great addition. Ah! Now I see why OTIS appears inside so many lifts - I never knew! Brilliant. Thanks for sharing.